Whenever I travel to different countries and cities, one of the things I'm interested in is how locals move around in their daily lives. Call me a transportation glutton, but I'm a sucker for trains, boats, rickshaws, trams, buses, gondolas, back alleys, and sidewalks. Then, of course, there's the most sublime transit invention of them all: the bicycle. It's so simple — even a non-techie like myself understands how it works — and yet so deliciously useful, relieving traffic, getting you anywhere quickly, reducing CO2, keeping you in shape, letting you see a place and interact with its people. 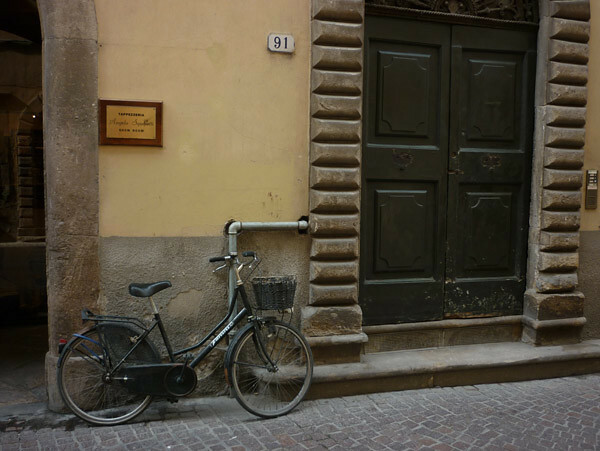 One thing I noticed on my trip to Italy a few months ago was how much bikes were part of everyday life. With David Byrne's Bicycle Diaries as my companion I strolled through the streets of cities and towns, trying to capture the mundane beauty of cycling. One of the biggest stumbling blocks in changing the ways we move around, eat, or do business, is the common perception that living a less fossil fueled life means sacrifice and inconvenience, even drudgery. In the case of the bicycle, the danger factor is often added to the list of reasons of why it would be such a bad idea to get out of our cars. Justice is a concept of great importance to all of us working for a better world. It is fundamental to theories of social order. Studies show that the sense of justice may be instinctual to our nature. Today, calls for justice are getting louder - calls for social justice, climate justice, environmental justice, economic justice, the list goes on. But in a world already sorely out of balance, with globalization transcendent, and with corporations controlling much of the world's resources and distribution systems, in some circumstances it can be difficult to know from whom to demand justice. The gap between the "haves" and "have nots" is getting more disproportional; unraveling the causes of fundamental injustices can lead to truths some of us would rather not face. Osaka's robot-run parking lots mixed with the Minneapolis lakefront; a musician's fantasy metropolis By DAVID BYRNE Originally published in the Wall Street Journal New Orleans on a rainy day. National Geographic Stock There's an old joke that you know you're in heaven if the cooks are Italian and the engineering is German. If it's the other way around you're in hell. In an attempt to conjure up a perfect city, I imagine a place that is a mash-up of the best qualities of a host of cities. The permutations are endless. Maybe I'd take the nightlife of New York in a setting like Sydney's with bars like those in Barcelona and cuisine from Singapore served in outdoor restaurants like those in Mexico City. Or I could layer the sense of humor in Spain over the civic accommodation and elegance of Kyoto. Of course, it's not really possible to cherry pick like this-mainly because a city's qualities cannot thrive out of context. A place's cuisine and architecture and language are all somehow interwoven. But one can dream. by RICHARD REGISTER It's time we put economics into some sort of physical scientific context that makes sense. Economists have drifted off into a disconnected world where, blinded by massive amounts of money and mystery, they see themselves as a kind of high priesthood calling the shots for practically everything, then saying they were blindsided by the debacle in the real estate world and the up-trading in wildly irresponsible and, strictly honest to say, greedy derivatives. Here at Ecocity Builders we try to stay focused on the positive even as bad news keeps rolling in - gigantic man-made disasters, wars, natural disasters increasing, corruption increasing, economic collapse, species going under, international laws and treaties being targeted and dismantled, world getting hotter, weather patterns changing, polar caps melting, fewer jobs, less support and money for education, less money for basic services, world leaders not leading. Excerpted from Autokind vs. Mankind by Kenneth R. Schneider, 1972 Ecocity pioneer Ken Schneider contemplates the world of cars in the early days of their takeover. Man has always had his tragedies. Today he has the automobile, a tragedy of love. Of course, the automobile is different. A plague, a famine, or an old-fashioned war was always disapproved, at least in public. A friend wrote recently saying she wasn’t aware of “ecovillages” that had a strong edge between higher density full community and immediately adjacent open space. Since I think the visual image of such an arrangement is so interesting and important, I’ll just record my response here. Thanks for your note and observation. I have seen some regular villages, not self-consciously ecovillages, that are extremely compact, in China in the 3 story range, in Turkey and Nepal in the six story range, with natural, grazing and/or agricultural land or waters immediately next door. City walls up against open space. There is Tori Superiori in Italy where a group of people hoping to create a self-conscious ecovillage purchased this almost single structure hyper compact small medieval village. Looks fascinating. I'd love to visit. [caption id="attachment_1163" align="alignleft" width="150" caption="Richard Register"] [/caption] If we take up less room there’s room for all of us, including the other animals and the plants of this planet. There are three largest categories of shrinking back to this generosity of living: 1.) heading toward far fewer of us, leaving room for a smaller “all” of us humans, 2.) reducing the scale and impact of our agriculture system and 3.) building our cities, towns and villages literally much smaller, based on the human body’s dimensions and needs for energy, shelter and land as compared with building cities for the demands of automobiles. Get those three very large topics covered and we might just get to live here in style (if not oppulent waste) for a long, long time.